Brake dust, road mud and salts in winter – these are the factors preventing alloy wheels and cars in general from maintaining their new look and individuality. This is why not only the auto body needs regular and thorough care (at least once every 2 weeks), but also the chromium wheel discs should be cleaned from time to time. It’s not a secret that many wheel disc purifiers manufactured at the moment contain aggressive components that of time instead of simplifying the cleaning process causes irreversible corrosion on the wheel disc surfaces within a short period. Such corrosion is almost impossible to eliminate and, as a result, after six to twelve months expensive discs have to be replaced. Both cleaning products provide careful treatment and prolonged protection from aggressive road factors, quickly eliminate old stains, restore the glance and individual appearance of your car. 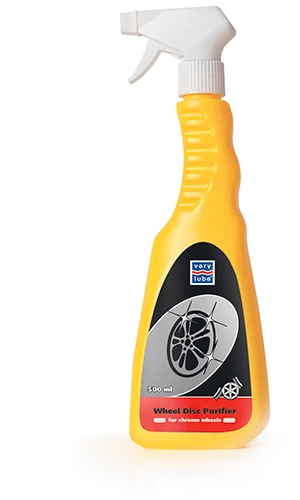 Wheel disc purifiers containing aggressive components damage brake discs, high-pressure hoses of the braking system, wheel studs or bolts. The cleaned discs should not be hot from sunlight, otherwise the cleaning product will dry up and stains will appear before washing up is finished. 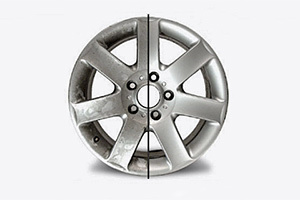 Both outer and inner sides of wheel discs must be cleaned. Use clean sponges or soft brushes to avoid unnecessary damage during the cleaning process. Do not expose the discs to the influence of high-pressure steam during powerwash cleaning, otherwise the discs will lose their glance. Do not exceed the time stated by the manufacturer that is necessary for proper cleaning.